A voltaic cell consists of two half cells, which are connected electrically. 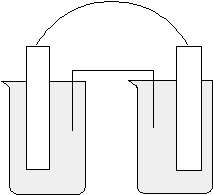 A half cell refers to the part of the cell in which one half reaction occurs, and in all text books is depicted as a metal electrode sitting in a beaker of electrolyte solution. 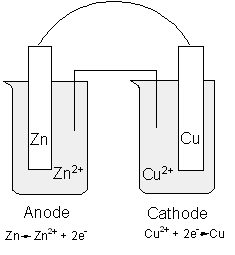 The half cell must contain an electrode, (if the reaction involves reduction to or oxidisation of the metal, the electrode will generally be that metal. If neither species in a half reaction is metal, an inert electrode such as platinum will be used). The solution must contain the relevant ions for the redox reaction to occur. The half cells need to be connected via a wire, so electrons can be transferred from one half cell to the other. The circuit may be connected via a voltmeter, so the potential of the cell can be measured. If a voltaic cell runs without a salt bridge, charge will quickly build up within the half cells and the cell would stop working. 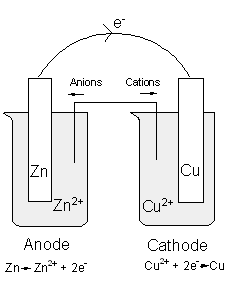 A salt bridge allows ions to flow into each half cell, balancing the charge and allowing extended operation of the cell, but preventing mixing of the two solutions. This is a fairly clumsy way of depicting cells, and there is a shortcut known as the “line notation”. The cell potential tells you how much of a driving force there is behind the cell reaction, and is the difference between the two half-cell potentials. The more positive the standard potential is, the better the species is at oxidising. The more negative, the better the reductant. Keeping in mind that Q is the reaction quotient and essentially the equilibrium constant (concentration of products/concentration of reactants) when the system isn’t at equilibrium. The reaction is the same for the equilibrium constant, except that at equilibrium the Ecell will be zero.